Carrick’s rich heritage has attracted a group of Icelandic visitors with a keen interest in history. The museum professionals were on a trip from Iceland to Northern Ireland with the aim of establishing better connections with their local counterparts. Hosted by Mid and East Antrim Borough Council, they revealed a special affinity for Ireland as their home town of Akranes - one of the oldest in Iceland - was settled at the end of the 9th Century by an Irish monk called Jörund the Christian and two brothers from Ireland, Ketill and Pormóður. The visitors also explained that each July the people of Akranes celebrate a special weekend called ‘The Irishdays’ because of this connection. They said Carrickfergus was top of their list of places to see because of the town’s own long and distinguished history. 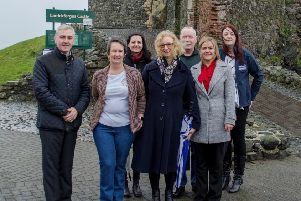 Carrickfergus Heritage and Tourism staff arranged an itinerary for them which began with a visit to Carrickfergus Museum and included a meeting with MEA museums officer Shirin Murphy. They discussed the work of the local museum service and the importance of the sector in Northern Ireland. The party also visited the Andrew Jackson Cottage and the US Rangers Centre at Boneybefore and Carrickfergus Castle and were taken on a walking tour. They later exchanged gifts including a photographic book of Akranes and a piece of volcanic rock. In return, the visitors took home a copy of archaeologist Ruairí Ó Baoill’s book ‘Carrickfergus – The Story of the Castle and Walled Town’.